The deadline for articles, press releases and sponsored White Papers for the next issue of S&T Journal (e-Digest) No.12, Vol.99, December 2008 is 15 December 2008. You can submit your article or press release online. For more information and instructions of preparation click <here>. San Jose, CA - November 10, 2008 - Modern day sensors have come a long way from their predecessors, which used transistors made of bulky semi-conducting materials. Advent of micro fabrication technology has led to miniaturization of biosensors. Indeed under stages of development currently are nano-sized electronic components. However, biosensors market is characterized by slower pace of commercialization, which is primarily attributed to high cost, availability of effective alternative technologies, and issues related to stability, sensitivity, and quality assurance. Biosensors in medical applications remains a hugely untapped market, attracting several new players, who in hopes of leveraging dormant market opportunities, are foraying into the marketplace. The United States and Europe dominate the global market for medical biosensors, collectively capturing 69.73% share estimated in 2008. The market in Asia-Pacific is projected to reach US$794 million by the year 2012. In medical diagnostics, majority of the biosensors (about 90%) are included in blood gas analyzers, electrolyte analyzers, glucose meters, and metabolite analyzers. Over half of the biosensors produced worldwide are employed in glucose meters. With a diabetes epidemic underway, there exists strong growth opportunities for diabetes management tools, such as glucose meters. Over the years, glucose-monitoring meters have undergone a sea change, with recent entries featuring wireless and sensor technologies and noninvasive glucose monitors. Sales in United States, the largest market for Glucose biosensors is expected to reach US$1.28 billion by 2012. In Europe, Germany, United Kingdom and France, together, collar 55.3% of the biosensors market estimated in 2008. Bioluminescence-based biosensors gained immense popularity as a screening procedure for testing water quality in the key nations such as France, Germany, Spain and Sweden. Revenues in the German Environmental Biosensors market are projected to climb at the fastest rate to reach US$32.7 million by the year 2015. SAN JOSE, USA - Sensor networks and smart sensors are being used widely in industries, including automotive, medical, industrial, entertainment, security, and defense due to increased usage of process controls and sensing elements in different sectors. Use of smart sensors in counter-terrorism applications including cargo tracking, biometrics among others is also increasing. Smart systems are being readily accepted by the auto industry as automakers explore ways to save lives, deflect safety concerns and preempt costly litigation. Smart systems can sense an impending crash, its nature, the presence of occupants, their position, and determine the type of airbags to be fired and the force and speed of their deployment. Motion-tracking sensors and inertial sensors based on micro-electromechanical system (MEMS) are widely being used in medical applications. Implantable devices that are small in size and yet possess high reliability, and handheld devices for use in diagnostics and home monitoring mainly drive the demand for such sensors. Europe represents the largest and fastest growing smart sensors market and is projected to reach US$2.1 billion by 2010, as stated by Global Industry Analysts Inc. Smart flow sensors represent the largest product segment in the global smart sensors market. North American smart flow sensors market is projected to reach US$660 million by 2010. Smart pressure sensors are expected to emerge as the fastest growing product segment in the smart sensors market worldwide. 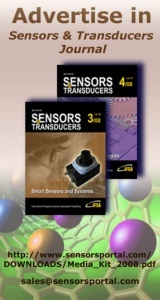 Smart Pressure Sensors market in Asia-Pacific is expected to post a CAGR of 6.5% over the period 2000-2010. The global market for nanotechnology will increase from $11.6 billion in 2007 to an estimated $12.7 billion by the end of 2008. It should reach $27 billion in 2013, a compound annual growth rate (CAGR) of 16.3%. Nanomaterials dominated the market in 2007, accounting for 87% of the total market. This is expected to decrease to 69.2% by 2013. Electronics, biomedical and consumer applications have high projected growth rates of 30.3%, 56.2% and 45.9% over the next 5 years. The MEMS business and MEMS industry are changing... For the first year, the MEMS business will almost reached $8B in 2008, with strong growth of the consumer applications but also for most of the applications in automotive, medical and industrial business. In volume, the growth of the MEMS markets is reaching 30% per year. Pushed by this growth, most of the large MEMS manufacturers are either investing in new 8" lines are transferring their production to MEMS foundries. More than 10 companies have already moved from 6" to 8" manufacturing line and more than 10 companies will follow very rapidly. A large number of devices under development since 5 years are now commercialize (pico projector, MEMS oscillator, RF switches, night vision micro bolometers...) and are fueling the growth of the MEMS business for the next 5 years. Even the MEMS packaging is changing: still more than 60% of the cost of a MEMS devices (with the test), MEMS packaging is changing with the introduction of wafer level packaging in larger scale and the introduction of 3D packaging in order to save costs and foot print. In addition, the report is providing an overview of the new companies created in 2007 and beginning of 2008 in MEMS, the new investments made, the M&A... in order to have an updated analysis of the changes and movement of the MEMS companies. From $7.8B in 2008 to $15.5B in 2012, the average growth of the MEMS markets is expected to reach 13% in value and 33% in volume. 2.5 B units have been produced in 2007 and we expected that 8 B units will be produced in 2012. Concerning production equipment, the market will grow from $310 M in 2007 to more than $650 M in 2012. In addition to this production equipment, the R&D equipment have to be added to these numbers.